Watch our video (above) to find out how to use the Intelligent Fingerprinting Drug Screening System for quick and hygienic drug testing that’s also dignified and cost-effective. 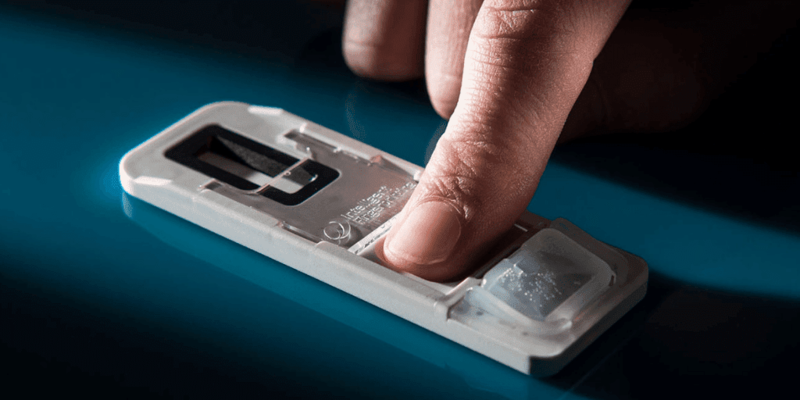 Our fingerprint drug test system is fully portable so screening can be carried out in a variety of locations whenever it’s needed. It has applications for use in drug treatment and family safeguarding services, safety-critical workplaces, within the criminal justice arena and by coroners for early intelligence on possible cause of death. The system screens for multiple drugs of abuse in one test: methamphetamines, cocaine, cannabis and opiates. 1. The fingerprint sweat test sample is collected onto the Intelligent Fingerprinting Cartridge – a process which takes less than a minute. 2. The tamper-evident Cartridge cover is closed to protect the sample. 3. The user follows the simple instructions on the Intelligent Fingerprinting Reader 1000, activating the test and placing the Cartridge into the Reader when instructed. 4. The Reader analyses the fingerprint sample. 5. In 10 minutes the Reader provides a pass or fail result for each drug group in the test.